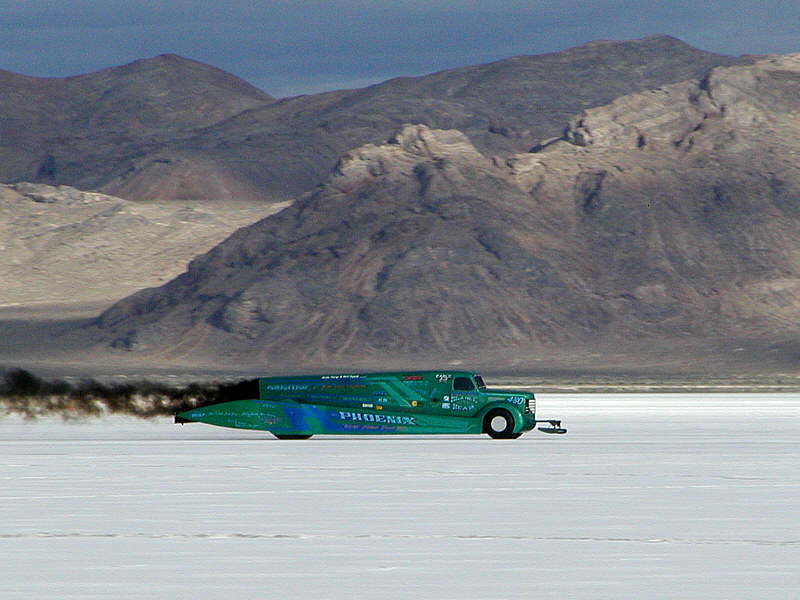 Bonneville Speed Week, we need a volunteer for World Finals and our big motor is running. During the Month of August, we didn't do very much on the car. In early august, Alan and I borrowed the racecar's trailer to haul a lot of equipment and supplies to the national caving convention in Porterville, CA. In mid August, Alan and I packed up the Bonneville timing equipment and headed for the Bonneville Salt Flats. We arrived Wednesday night, and started setting up the equipment Thursday Morning. We didn't bring the racecar since we have to spend too much time working the timing equipment, and the days are VERY long; on Sunday we worked from 5:30 AM until almost 9:00 at night. Except for pesky reoccurring weather issues, the meet went very smoothly. The first storm was Friday night, and didn't do too much except leave a lot of thunder storms in the area that plagued us all Saturday. If a lighting strike is strong enough, it can trip the sensors making the clocks think a car has gone by. The operators have to watch closely and reset the sensors if this happens. Most of the rest of the week was fine, but Wednesday afternoon, they were back, and Thursday morning there was lots of heavy clouds lingering around ominously. It made for great pictures, but all day Thursday we had to be on our toes to fix the occasional lightning errors. Then just before 5 PM, the starting line reported strong gusts of wind, and within a couple of minutes, the meet had to be canceled for the day as racers and workers ran for cover or raced to secure anything that could blow away. Wind storm hitting the pits. Davis instruments who supplied the weather station seen here, included this photo in their september 2003 newsletter. Our weather station reported gusts over 60mph, and sustained winds at 49mph. Although it didn't last long, the storm did a fair amount of damage to the track equipment, (the track surface was left in excellent shape). Because Friday was the last scheduled day of racing, and more storms were forecast, the decision was made to only run record runs Friday morning, then pack up and get out before the weather got too bad. It turned out that was an excellent call, because we finished the record runs and got packed and out just before noon. By One o'clock, the rain started, and by 2 o'clock, the entire salt flats were flooded. I hope everyone got out before then. None of the really fast streamliners were at this meet, so the top speed was set by a lakester, (first time since the 1960's), and for the first time, a woman had the fastest speed, at around 320 mph. Another interesting highlight was the Phoenix Diesel Truck that ran around 280mph. It's that time again; We are looking for a volunteer to help us at World Finals in October. The lucky candidate must have car building / racing experience, and be available the October 13 - 18. We will provide transportation from So Cal, shared hotel room, and meals. If you've always wanted to see what racing at Bonneville Salt Flats is like, especially from the point of view of a race team member, here's your chance. The days are cool, and the hours are a lot shorter than in August. Plus we'll give you a T-shirt! If interested, please contact Alan Rice for more information. The Big Motor (1560cc) is running in Texas. Richard, 'Busa-Joe and the crew at Southwest Superbikes finished rebuilding our bored & stroked Hayabusa motor and dynoed it at 207 HP. Were hopping it will arrive in time for the September El Mirage meet, if not we'll be running the small motor again. With all the rain that the high desert has been getting, there may not even be a meet. If you were planning to attend, call one of us on Friday evening for an updated status.